Enjoy a relaxing Honolulu bike tour on an afternoon downhill biking adventure high above Honolulu. Coast down a paved jungle road on easy-to-ride cruiser bikes with fabulous views. Suitable for the whole family, this 3-hour outdoor adventure includes all equipment, (kids bikes and trailers available ) deli-lunch and Waikiki hotel pickup. To combine this tour with a morning waterfall hike and/or an afternoon sail and snorkel tour... See our Half-Day Bike, Sail and Snorkel or Full-day Bike, Hike Sail and Snorkel tour listed on TravelToe. Bike Hawaii and experience a guided tour the whole family will love. 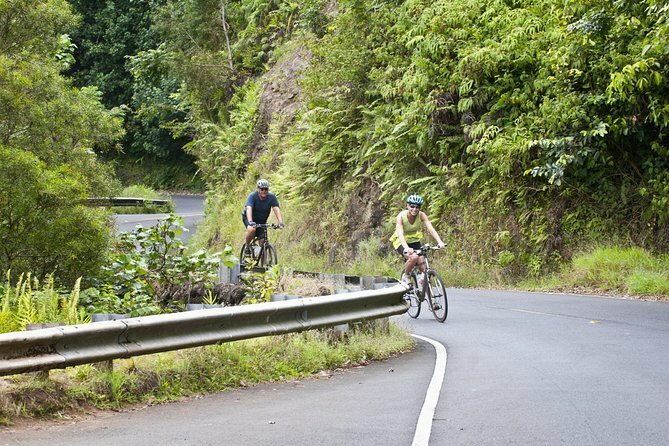 You'll coast downhill on a paved road nestled in the lush Pu'u 'Ohia rainforest. This unique experience combines Hawaii's tropical rainforest with magnificent panoramic views of scenic Oahu. The bike tour is an easy 5-mile (8km) tropical bike ride suitable for the whole family. As you wind your way through the rainforest, the only sounds you'll hear are the wind in the trees and the local bird life calling. Along the way your nature guide will introduce you to the culture, plants and geology of the Hawaiian Islands. Bike, helmet and rain gear is provided, as well as a deli-style lunch and drinks. Enjoy more time in the great outdoors and add an optional hiking adventure to your day. Discover the hidden hiking treasures of Oahu's lush volcanic rainforest on a 2-mile round-trip guided hike. This is a rare opportunity to explore 75-acres of sacred land and discover a side of Hawaii many visitors miss out on. This is a mild to moderate hike over dirt trail. Hiking time is approximately 1.5 hours.